We have a laundry list of boastful things hailing from S.F. — sourdough bread, the Mission burrito, T.V. (bet you didn’t know that). Another bragging right we’re glad our city can take ownership of? Being home to cosmetics powerhouse Benefit — in case you haven't noticed, we're obsessed. And, sure, you’re probably used to seeing the pink-and-white-hued shops sprinkled around town (namely, on Chestnut and Fillmore), but now Benefit is hitting it home with a shiny-new, downtown flagship (with the tagline "we built this city on beauty and brows! "), which is already open for business. Perched across the street from Banana Republic in the former Paul Frank location, the 1,200-sqaure-foot space is the biggest S.F. Benefit shop yet and will house all of the adorably packaged goodies, brow bar, tanning and waxing stations, and other services we’re used to, now showcased in the whopper of all Benefit stores. We got a little sneak peek yesterday, and, of course, have the pictures to prove it. If you’re ready for a brow-raising new addition to the downtown beauty scene, you’ve met your match. 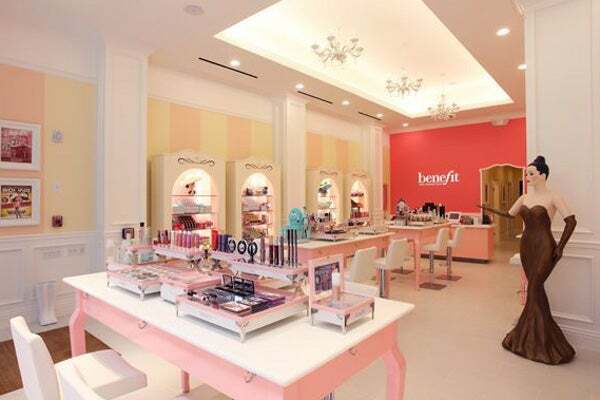 Benefit Cosmetics, 262 Sutter Street (at Grant Avenue); 415-749-9073.